Forget about the fan bizarrely throwing a golf ball with an earplug attached at Rory McIlroy and Rickie Fowler. The big news from the Wells Fargo Championship in Charlotte as far as Irish golf fans are concerned would appear to be that Mcilroy is building up to play well at the Dubai Duty Free Irish Open. Having said on Wednesday that he’d spent his time since the Masters recharging his batteries and working on his swing, he was clearly still stuck in practice mode as he went out in four over 40 on the tough back nine but birdied three of his last five coming home to salvage a one over 73 that was one better than Pádraig Harrington. "Yeah, it sort of was a tale of two nines. As I said in the press conference yesterday, I've been working a lot on the range and I was sort of still in range mode on the front nine there. I didn't really have my scoring head on. I was thinking about my golf swing and just trying to make good swings at it and I sort of got caught up in that a little bit. Explaining that his current swing flaw is a direct result of a swing change he worked on during his winter break, McIlroy said: ”I was getting it sort of a little bit behind me on the takeaway at Augusta and then setting it sort of deep. “When you look at my swing from down the line, I usually set the club through my right shoulder and it’s setting somewhere in my right biceps. Coming into that ball I was feeling like the club was laying down a little bit and I sort of had a fear of it going left at Augusta so I was holding onto a lot of shots and that was creating quite a lot of inconsistency with how far I was hitting the ball. "There was a lot of rotation going through impact. So I'm trying to get it more so I'm setting it a little more vertical so when I come down again, it's more on the plane and I'm able to keep the club face square longer through impact. "It's just something that I've actually, I was working on something at the start of the year and I've just overdone it, so I just have to try and get it back to where I want it to be. It’s a work in progress, but it feels better than what it did at Augusta.
" I feel like I can release the club a little bit more. Even though there’s a few that are still going left, at least I know what the problem is and I’m working hard to try and fix it." McIlroy said that he knew he was going to have to play with swing thoughts in his head but he hopes to fight his way back into contention over the next few days and “weeks” which would indicate that he’s targeting having his game firing on all cylinders by the K Club. "I knew I was going to have to sort of play my way into the next couple of weeks. With the nine holes that I played on Tuesday and the pro-am yesterday, I felt, it actually feels pretty good. But it's all different. It’s always different when you get a scorecard in your hand and it really matters. "I started off pretty well today but then there was just some shots where I was thinking so much about the swing rather than actually the shot that I was trying to hit and that was really the problem for the front nine. I didn’t feel like I did that much wrong, but you don't have to on this golf course for it to punish you. “But I played the front nine a bit better, and if I can play a little bit more like that over the next three days, then I can definitely get myself back into the tournament. "I would much rather be in red numbers but I'm much happier where I am now than I was three hours ago, I guess. I just need to go out tomorrow and shoot a good second round, something in the 60s, get myself back into the tournament going into the weekend. Fowler shot a one under 71 despite the incident with the fan throwing the ball with the earplug attached on the sixth, their 15th. “Yeah, it was sort of weird,” McIlroy said. "That's never really happened to me before. Just it was one of those things. Putting poorly again, Harrington bogeyed the fourth, fifth and sixth, birdied the eighth but then bogeyed the 14th after finding water from the tee. He appeared to rally when he eagled the 15th by holing a 37-yards pitch to get back to one over but he bogeyed the last for a two over 74 that left him tied with Shane Lowry. The Clara man was also uninspired on the greens, missing a four footer for par at the last in a round featuring four bogeys and two birdies. At the top of the leaderboard, Steve Wheatcroft and playing partner Andrew Loupe shot seven under 65s to lead by one stroke from India’s Anirban Lahiri. 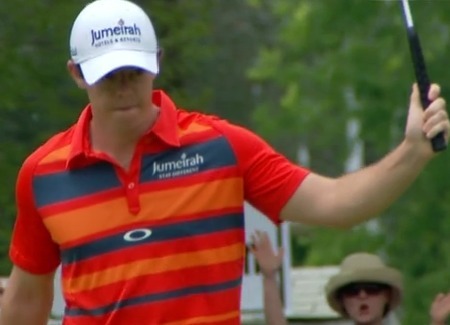 Rory McIlroy is just two shots behind former Walker Cup rival Webb Simpson in the Wells Fargo Championship. Rory McIlroy stirred memories of the magical weekend that gave him his first PGA Tour win at Quail Hollow just two years ago when he slammed his boot to the floor and carded a six under par 66 to trail leader Webb Simpson by just two shots entering the final round of the Wells Fargo Championship. Ten years after blitzing Royal Portrush with a 61, Rory McIlroy shaved a stroke off his Quail Hollow course record he set en route to his maiden PGA Tour victory there in 2010 to storm in to a commanding lead in the Wells Fargo Championship.